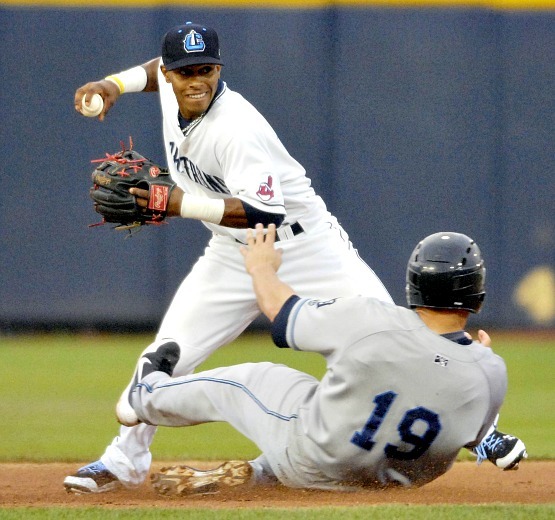 Eastlake, OH: The West Michigan Whitecaps had a successful trip to Ohio, taking two of three games from the Lake County Captains. Their only loss of the series was an interesting one, though, as they faced former Major League pitcher Fausto Carmona, er, I mean, Roberto Hernandez. Wait…what? Hernandez is serving a three-week suspention from MLB, and made a rehab start for the Captains in game two of the series with West Michigan. The picher formerly known a Carmona was arrested in January for identity theft in the Dominican Rebublic for assuming the name of a family friend. The Cleveland Indians thought they were signing a 17 yr-old back in 2000, but in reality, Hernandez was 20. Three years later he was pitching for the Captains, going 17-4 with a 2.06 ERA in 2003. Six years later, he had to wait for a new visa to come into the United States. How he was granted a new visa with a fraud conviction, I’ll never know, but money talks I guess, and Major League Baseball slapped him with a whopping three-week suspension. Back on track- he did earn his first professional victory since Sept. 20, 2011 against the ‘Caps, as they were downed 5-4 by Lake County. Hernandez gave up three runs on six hits. West Michigan didn’t show the 31 yr-old much respect out of the gate, though, as they scored two runs in the first inning on an Aaron Westlake home run. Eugelio Suarez singled before him. In the fourth inning, Jason King doubled, and scored on an RBI by Patrick Leyland. In the end, two errors costs the ‘Caps the winning run and the game. Carmona Hernandez is eligible to join the Indians on August 11. The Whitecaps dominated the first game of the series 8-1. On the hill for the ‘Caps, Chad Smith was successful in his first start in the Midwest League. In three innings he allowed one hit and struck out three. Along with the bullpen, he held the Captains to only four hits on the night. This was only Smith’s fifth pro start after Tommy John surgery last year. West Michigan was led offensively by Jason King, who ended the game going 3-5 with a home run and three RBI’s. The ‘Caps scored six runs in the seventh inning to break the game wide open. King and Brandon Loy each drove in two runs in the inning. Loy was 2-4 in the game with a pair of doubles. Jason Krizan also doubled in a pair of runs in the inning. 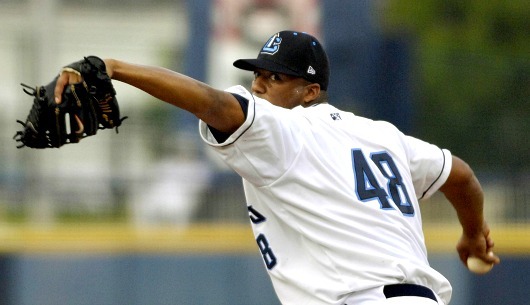 The Whitecaps received more solid pitching in a 4-0 victory in the last game of the series. Marcelo Carreno threw six shutout innings and only allowed one hit. Loy helped out with his bat, scoring two with a single in the second. Jeff McVaney would drive him home for a 3-0 lead. In the eighth, McVaney tripled and was hit home on a single by King. Leyland and Krizan each singled to load the bases with no outs when the game was called due to lightning. I actually had no idea what happened to mister Fausto Roberto Carmona Hernandez, so thanks for the semi-unintentional fill-in. I just want to make sure I have this right, though. Carmona Hernandez pitched for the Indians’ minor league team against the Tigers minor league team, which you follow/go to games of. Is that right? I figured Carmona Hernandez was let go by the Indians after the incident, but I don’t know why. Mateo-yeah Carmona was his ‘old’ name with the Indians. He got a new visa when his real identity was discovered. He was serving his suspension from MLB when he faced the ‘Caps. Does your use of the past tense mean he is in the major leagues now, or elsewhere? He’s still with the Indians, but serving a suspension where he can play Minor League games. He can go back to Cleveland on August 11.